The formal verification of software has become an intriguing direction to overcome the current state of omnipresent bug-ridden software. The seL4 kernel is a landmark in this field of research. It is a formally verified high-performance microkernel that is designed to scale towards dynamic yet highly secure systems. However, until now, seL4 was not accompanied with a scalable user land. The seL4 user-land development is primarily concerned with static use cases and the hosting of virtual machines. With Genode 16.08, we finally unleash the potential of seL4 to scale to highly dynamic and flexible systems by making the entirety of Genode components available on this kernel. Section Interactive and dynamic workloads on top of the seL4 kernel explains this line of work in detail. Speaking of formal verification, the developers of the Muen separation kernel share the principle convictions with the seL4 community, but focus on static partitioned systems and apply a different tool set (Ada/SPARK). With Genode 16.08, users of the Muen separation kernel become able to leverage Genode to run VirtualBox 4 on top of Muen. Section VirtualBox 4 on top of the Muen separation kernel tells the story behind this line of work. As we consider VirtualBox a key feature of Genode, we continuously improve it. In particular, we are happy to make a first version of VirtualBox 5 available on top of the NOVA kernel (Section Experimental version of VirtualBox 5 for NOVA). Another focus of the current release is the framework's network infrastructure. Section Virtual networking and support for TOR introduces a new network-routing component along with the ability to use the TOR network. Section Network-transparent ROM sessions to a remote Genode system presents the transparent use of Genode's ROM services over the network. Further highlights of the current release are new tools for statistical profiling (Section Statistical profiling), profound support for Xilinx Zynq boards (Section Execution on bare Zynq hardware (base-hw)), and new components to support the use of Genode as general-purpose OS (Section Utility servers for base services). seL4 is a modern microkernel that undergoes formal verification and promises to be a firm foundation for trustworthy systems. Genode - as operating system framework - on top of a microkernel pursues goals of the same direction. Even though seL4 is designed to accommodate dynamic systems in principle (in contrast to static separation kernels), so far the seL4 community focused on static workloads on top of their kernel. Most current seL4-related projects employ the CAmkES framework, which allows the creation of static component-based systems. The combination of seL4 with Genode would unleash the full potential of seL4 by enabling seL4-based systems to scale to dynamic application domains. With far more than a hundred ready-to-use components, Genode provides a rich library of building blocks, starting from native device drivers, resource multiplexers, over protocol stacks, application frameworks (e.g., Qt), to applications (e.g., web browser Arora). With the potential synergies of both projects in mind, we already added basic Genode/seL4 platform support in the past releases. The existing experimental support was sufficient to showcase the principal feasibility of this combination - admittedly mainly to technical enthusiasts. With the current release, we ramp up the platform support of Genode/seL4 to a degree that most interactive and dynamic workloads of Genode can be executed on seL4 out of the box. We updated the seL4 kernel to version 3.2.0 and enabled all available time-tested x86 Genode drivers for this kernel. The main working items have been the implementation of interrupts, I/O port access, memory-mapped I/O access, the support for asynchronous notifications, and the lifetime management (freeing) of resources in Genode's core component. We tested many of our existing system scenarios on Qemu and on native x86 hardware and are happy to report that the following drivers are fully functional for Genode/seL4: the PIT timer, PS/2, USB stack, AHCI driver, ACPI driver, VESA driver, audio driver, Intel wireless stack, and Intel graphics driver. All automated test scenarios are now routinely executed nightly on QEMU and on native hardware as done by Genode Labs for all supported kernels. Screenshot of various Genode components running directly on seL4. 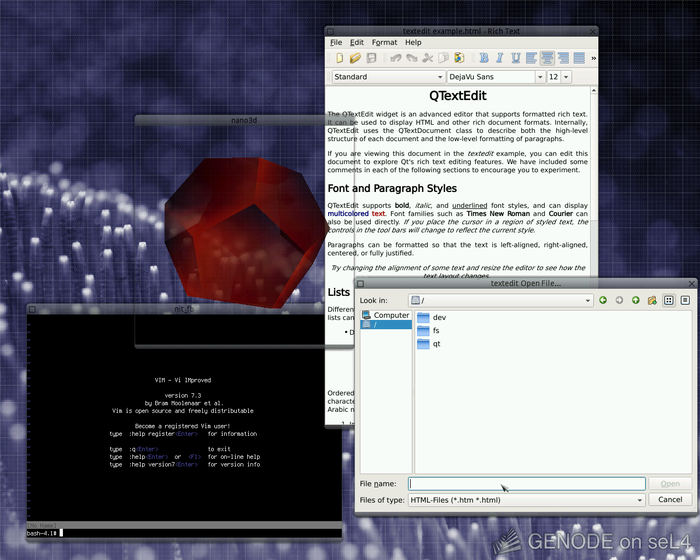 The Noux environment on the bottom left allows the use of GNU software such as bash, coreutils, and vim as one subsystem. Each of noux, the Qt5 application on the right, and the front-most 3D demo application are independent subsystems that cannot interfere with each other unless explicitly permitted by the system policy. Under the hood, the scenario is supported by several device drivers (e.g., USB, PS/2, VESA) whereby each driver is executed in a dedicated protection domain. Minor adjustments and patches to the seL4 kernel were necessary, which we are currently contributing back to the seL4 community. The changes concern device memory required by ACPI, VESA, and Intel graphics; the IRQ IOAPIC handling, and the system-call bindings. As Genode facilitates the use of shared libraries, the system-call bindings had to be adjusted to be usable from position-independent code. A minor seL4 extension to determine the I/O ports for the serial cards via the BIOS data area has already reached the upstream seL4 repository. Limit of physical memory: The usable physical memory must be below a kernel constant named PADDR_TOP (0x1fc00000, ~508 MB). Additionally, some allocators for memory and capabilities in Genode/seL4 are statically dimensioned, which may not suit x86 machines with a lot of memory. We tested the scenario on Lenovo Thinkpads such as x201, x250, or T430. Note that the scenario uses the VESA driver (as opposed to the native Intel graphics driver), which may not work on all machines. This is why at some point, we renamed the component to NIC router and treated the initial NAT functionality merely as a flavour of the new feature set. 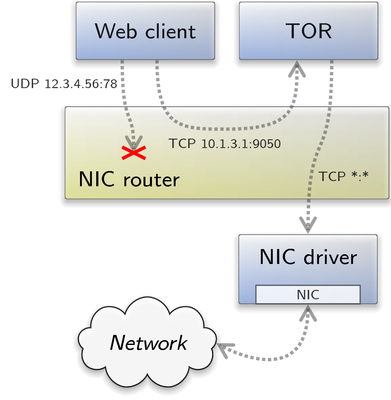 One use case that influenced the development of the NIC router in particular was the integration of TOR into Genode scenarios. The configuration states that all connected components use disjoint IP subnets. The NIC router acts as a NAT gateway between them, and - dependent on its role - uses the IP addresses 10.1.1.2, 10.1.2.1, or 10.1.3.1 as its gateway address. Moreover, it states that the web client can open up to hundred TCP connections concurrently to the TOR component restricted to port 9050, and the TOR component in turn can open up to hundred TCP connections to the outer network regardless of the target IP address or port number. For a detailed explanation of all configuration items, you may refer to the README of the NIC router at repos/os/src/server/nic_router/README. Having the TOR port and the new NIC router available in Genode's components kit, we are now able to move single network applications, or even whole virtual machines into the TOR network. In contrast to existing approaches, the crucial code base needed to anonymize the network traffic, namely the TOR proxy component, depends on a much less complex code base. As it directly runs on top of Genode and does not depend on a virtualization environment, or a legacy monolithic kernel OS, we can reduce its TCB by orders of magnitude. The above-mentioned example scenario, whose run-script can be found in the Genode-world repository under run/eigentor.run comprises approximately 460K compiled lines of code when running on top of the NOVA kernel. Thereby the lion's share of the quantity is introduced by the TOR software itself, and its library dependencies like OpenSSL. If we do not consider the TOR component itself, the trusted computing base sums up to 60K lines-of-code in our example. Compare this to for instance 1500K compiled lines of Linux kernel code when using an Ubuntu 14.04 distribution kernel alone, not to mention init process, Glibc, etc.. Especially in combination with virtualization this scenario might become an interesting technological base for approaches like TAILS or Whonix. The ability to run VirtualBox on top of a microkernel has become a key feature of Genode. For this reason, the current release pushes the VirtualBox support forward in two interesting ways. First, VirtualBox has become available on top of the Muen separation kernel. This undertaking is described in Section VirtualBox 4 on top of the Muen separation kernel. Second, we explored the use of VirtualBox 5 on top of the NOVA kernel - to a great success! This endeavour is covered in Section Experimental version of VirtualBox 5 for NOVA. As briefly mentioned in the Genode 16.05 release notes, we have been working on VirtualBox support for hw_x68_64_muen. The implementation has finally reached a stage where all necessary features have been realized and it has been integrated into Genode's mainline. This means that you can now run strongly isolated Windows VMs on the Muen separation kernel offering a user experience that is on par with VirtualBox on NOVA. When we started our work on Genode, our initial plan was to leverage its VirtualBox support as a means to run Windows on Muen. As a first step we ported the base-hw kernel - back then ARM-only - to the 64-bit Intel architecture. The resulting hw_x86_64 platform was included in the 15.05 release. Building on top of hw_x86_64, we then implemented support for running the base-hw kernel as guest on the Muen separation kernel. As the porting work progressed quite quickly, this line of work became part of Genode 15.08. Having laid the groundwork, we could then tackle the task we initially set out to do: bringing VirtualBox to Muen. On Muen, Genode runs as a guest in VMX non-root mode without special privileges. VirtualBox is executed as a user-level component, which makes the architecture special in the sense that the virtual-machine monitor (VMM) itself is running inside a strongly isolated VM. The guest VM managed by VirtualBox is a separate Muen subject with statically assigned resources. Access to the guest VM memory is enabled by mapping it into the VMM's address space at a certain offset specified in the Muen system policy. Similarly, the guest subject state is mapped at a predefined address so VirtualBox can manipulate e.g., register values etc. After the initial setup, hardware-accelerated execution of the guest VM is started by triggering a handover event defined in the Muen system policy. The guest VM is then executed in place of the Genode subject. Control is handed back to VirtualBox when a trap occurs during the execution of the guest VM, e.g., the guest accesses resources of a device that is emulated by a VirtualBox device model. Furthermore a handover back to the VMM can be forced by using the Muen timed event mechanism. This prevents CPU monopolization by the guest VM and ensures that VirtualBox gets its required share of execution time. Even though the VirtualBox support on Muen draws largely from the existing NOVA implementation, there are some key differences. One aspect, as mentioned above, is that VirtualBox and its managed VM are never executed simultaneously. From the perspective of the base-hw kernel, switching to and from the guest VM is similar to the normal/secure world switch of ARM TrustZone. This enabled us to reuse the existing base-hw VM session interface. Whereas on NOVA, guest VM memory is donated by the VirtualBox component, the guest has its own distinct physical memory specified in the Muen system policy. Thus the guest-VM resources, including memory, are all static and VirtualBox does not need to map and unmap resources at runtime. Since guests on Muen run in hardware-accelerated mode as much as possible, VirtualBox does not need to emulate entire classes of instructions. One important example is that the guest VM directly uses the hardware FPU and the VMM does not emulate floating point instructions. Therefore, it does not need to have access to the FPU state. This greatly reduces the implementation complexity and avoids potential issues due to the loading of an invalid FPU state. As mentioned above, the most intriguing peculiarity is that on hw_x86_64_muen, VirtualBox itself is running in VMX non-root mode and thus as a guest VM. 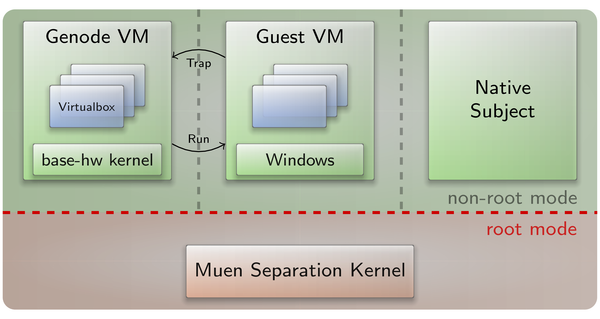 This means that the VMM is executed like any other Muen subject without special privileges, retaining the strong isolation properties offered by the Muen SK. Despite this architectural difference, there is no noticeable performance hit due to the extensive use of hardware accelerated virtualization. The necessary extensions to the hw_x86_64_muen kernel primarily consist of the implementation of the VM session interface. A VM session is a special base-hw kernel thread that represents the execution state of the guest VM. It is scheduled when the guest VM is ready to continue execution. The Vm::proceed function implements the switch to the mode-transition assembly code declared at the _vt_vm_entry label. The entry enables interrupts and initiates a handover to the guest VM by invoking the event specified in the Muen system policy. On return from the guest VM, the VM thread is paused and the VM session client (VirtualBox) is signaled. Once VirtualBox has performed all necessary actions, the guest VM is resumed via invocation of the VM session run function. Another adjustment to the kernel is the use of Muen timed events for guest VM preemption. The timer driver writes the tick count of the next kernel timer to the guest timed events page. This causes the guest VM to be preempted at the requested tick count and ensures that the guest VM cannot monopolize the CPU if no traps occur. On the VirtualBox side, we implemented the hwaccl layer for Muen. The main task of this layer is keeping the guest VM machine state between VirtualBox and the hardware accelerated execution on Muen in sync. Depending on the guest VM exit reason, the hwaccl code decides whether to use instruction emulation or to resume the guest VM in hardware accelerated mode. If a trap occurred that cannot be handled by the virtualization hardware, execution is handed to VirtualBox's recompiler that then emulates the next instruction. Furthermore, this code also takes care of guest VM interrupts. Pending interrupts are injected via the Muen subject pending interrupts mechanism. IRQs are transferred from the VirtualBox trap manager state to the pending interrupts region. If an IRQ remains pending upon returning from the guest VM, it is copied back to the trap manager state and cleared in the subject interrupts region. Follow the tutorial section to prepare your system for Muen. As a next step, create a VirtualBox VM with a 32-bit guest OS of your choice and install the guest additions http://download.virtualbox.org/virtualbox/4.3.36/VBoxGuestAdditions_4.3.36.iso. In this tutorial, we chose Windows 7. Note: use guest additions close to the VirtualBox version of Genode. We have successfully tested versions 4.3.16 and 4.3.36. 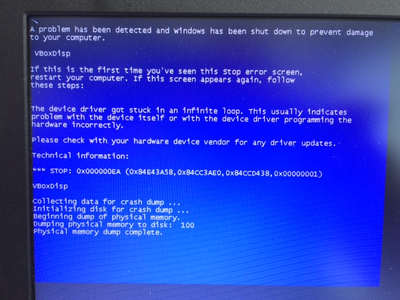 This produces a multiboot system image, which can be found at var/run/vbox_auto_win7/image.bin. Apart from these restrictions, the implementation of VirtualBox on Muen offers the same functionality and comparable performance as VirtualBox on NOVA. While implementing VirtualBox support for hw_x86_64_muen, we encountered several issues which required some effort to resolve. The visible effects ranged from VirtualBox's guru meditation, over guest kernel panics, to stalled guests and erratic guest behavior (e.g., guest execution slow-down after some time). To make things worse, these errors were not deterministically reproducible and instrumenting the code could change the observable error. One particular source of problems was the correct injection of guest interrupts. The first approach was to define a Muen event for each guest interrupt within the policy. When VirtualBox had a pending guest interrupt, the corresponding event was triggered to mark it for injection upon guest VM resumption. This approach revealed several problems. One such issue was that interrupts could get lost due to a mismatch between effective guest VM and VirtualBox machine state, e.g., the guest VM had interrupts disabled and execution was handed back to the recompiler before the pending interrupt could be injected. Scalability raised another issue, since all possible guest interrupts needed to be specified in advance in the Muen system policy. The problem was further compounded as guest interrupts vary depending on the operating system. We resolved the issue by enabling monitor subjects (VirtualBox) to access the Muen pending interrupts data structure of the associated guest VM. This simple enhancement of Muen allows VirtualBox to directly mark guest interrupts pending without having to trigger a Muen event or having to extend the Muen kernel. Furthermore, keeping the pending interrupt state of the guest VM and the VirtualBox machine state in sync has become trivial and thus no interrupts are lost. Another cause for grief was that, by default, VirtualBox scenarios on Genode are configured to use multiple CPUs. This could lead to guest state corruption since multiple emulation threads (EMT) were operating on the same subject state. Once we had discovered the underlying cause for this problem, we remedied the issue by clamping the guest processor count to one. Looking back at the adventurous journey beginning with the base-hw x86_64 port and culminating in the VirtualBox support for Muen, we are quite happy on how we were able to achieve the goal we initially set out to accomplish. We would like to thank the always helpful guys at Genode Labs for their support and the rewarding collaboration! We experimented with upgrading our VirtualBox 4 port to the newer VirtualBox 5 version in order to keep up with the current developments at Oracle. Additionally, we used this experimental work as an opportunity to explore the reduction of the number of Genode-specific modifications of VirtualBox. We found that we could indeed use most of the original PGM source code (Page Manager and Monitor), which we originally replaced by a custom Genode implementation. This is a great relief for further maintenance. One major benefit using the original code is that it enabled us to use the IEM component of VirtualBox - an instruction emulator - as virtualization back end for the handling of I/O operations. The IEM has far less overhead than the traditionally used QEMU-based REM (Recompiled Execution Monitor). The current state is sufficient to execute 32-bit Windows 7 VMs on 64-bit Genode/NOVA. Since the port is still incomplete and largely untested for other VMs, and to avoid trouble with the newly added VirtualBox 4 Genode/Muen support, we decided to make this port available as separate VMM besides the VirtualBox 4 VMM and the Seoul VMM on Genode/NOVA. To test-drive VirtualBox 5 on NOVA, please refer to the run script at ports/run/vbox_auto_win7_vbox5.run. By adding the device model for the AHCI controller to our version of VirtualBox, virtual machines become able to use virtual SATA disks. This way, we can benefit from the more efficient virtualization of AHCI compared to IDE and - at the same time - Genode's version of VirtualBox becomes more interoperable with existing VirtualBox configurations. enforces the delivery of PCI IRQs to the IOAPIC. The previous release overhauled the framework's API in several areas to ease the development of components that are robust, secure, and easy to assess. One of the changes was abolishing the use of format strings in favour of a much simpler and more flexible text-output facility based on C++11 variadic templates. During the past release cycle, we adapted almost all Genode components to the new text-output API. In the process (we reworked over 700 source files), we refined the API in three ways. First, we supplemented the log output functions provided by base/log.h with the new Genode::raw function that prints output directly via a low-level kernel mechanism, if available. Since the implementation of this function does not rely on any Genode functionality but invokes the underlying kernel directly, it is ideal for instrumenting low-level framework code. Since it offers the same flexibility as the other output functions with respect to the printable types, it supersedes any formerly used kernel-specific debugging utilities. Second, we added overloads of the print function for the basic types signed, unsigned, bool, float, and double. Individual characters can be printed using a new Char helper type. Third, we supplemented types that are often used by components with print methods. Thereby, objects of such types can be directly passed to an output function to produce a useful textual representation. The covered types include Capability (which reveals the kernel-specific representation), String, Framebuffer::Mode, and Mac_address. While adjusting the log messages, we repeatedly stumbled over the problem that printing char * arguments is ambiguous. It is unclear whether to print the argument as pointer or null-terminated string. To overcome this problem, we introduced a new type Cstring that allows the caller to express that the argument should be handled as null-terminated string. As a nice side effect, with this type in place, the optional len argument of the String class could be removed. Instead of supplying a pair of (char const *, size_t), the constructor accepts a Cstring. This, in turn, clears the way to let the String constructor use the new output mechanism to assemble a string from multiple arguments (and thereby getting rid of snprintf within Genode in the near future). To enforce the explicit resolution of the char * ambiguity at compile time, the char * overload of the print function is marked as deleted. Note that the rework prompted us to clean up the framework's base headers at a few places that may interfere with components using those headers. I.e., we removed unused includes from root/component.h, specifically base/heap.h and ram_session/ram_session.h. Hence, components that relied on the implicit inclusion of those headers have to manually include those headers now. We changed the construction argument of the Session_label to make it more flexible to use. Originally, the class took an entire session-argument string as argument and extracted the label portion. The new version takes the verbatim label as argument. The extraction of the label from an argument string must be manually done via function label_from_args now. This way, the label operations become self-descriptive in the code. At the same time, this change will ease our plan to eventually abandon the ancient session-argument syntax in the future. Note that this API change affects the semantics of existing code but unfortunately does not trigger a compile error for components that rely on the original meaning! Of course, we updated all mainline Genode components, but custom components outside the Genode source tree should be revisited with respect to the use of the Session_label utility. For building Genode-based distributed systems, a communication mechanism that interconnects multiple Genode devices is required. As a first step, we added proxy components to the world repository that transparently forward ROM sessions to a remote Genode system. As "ROM" represents one of the most common session interfaces, the proxy components already enable the distribution of many existing Genode applications. The basic usage scenario comprises two hosts (A and B) that are connected to the same network and are both running a NIC driver. One of the hosts (A) is running the application that shall communicate with the ROM service running on the other host (B). In order to establish this communication transparently, init is configured such that the application component connects to the ROM client proxy, which acts as a proxy ROM service. On host B, init is configured such that the ROM service proxy connects to the actual ROM service. Both proxy components connect to the corresponding NIC driver and use a minimalistic IP-based protocol to transport the data and signals of the ROM session. Furthermore, the proxy components must be configured with static IP addresses and the module name of the ROM session. Optionally, the ROMs can be populated with default content. For testing purposes you can use the ROM logger as an application and the dynamic-ROM component as a ROM service. Note that the implementation is not inherently tied to the NIC session or the IP-based protocol but is actually intended to be modular and extensible e.g., to use arbitrary inter-system communication and existing protocols. In order to achieve this, the implementation is split into a ROM-specific part and a back-end part. The back end is implemented as a library and used by both the client and server proxies. In summary, the client proxy implements the Rom_receiver_base and registers an instance at the back end, whereas the server proxy implements the Rom_forwarder_base and registers it at the back end. You can find the base classes at include/remote_rom/. Thanks to Johannes Schlatow for this implementation. The CPU sampler provides the CPU service to the subsystem under test. Even if this subsystem consists only of a single component, it must be started by a sub-init process to have its CPU session routed correctly. The CPU sampler then collects the instruction pointer samples and writes these to an individually labelled LOG session per sampled thread. The FS-LOG component receives the sample data over the LOG session and writes it into separate files in a RAM file system, which can be read from an interactive Noux shell. This scenario, as well as a simpler scenario - without FS LOG, the RAM file system, and Noux - can be built from a run script in the gems repository. The sample_interval_ms attribute configures the sample rate in milliseconds. The sample_duration_s attribute configures the overall duration of the sampling activity in seconds. The policy label denotes the threads to be sampled. These scripts should be understood as a proof-of-concept. Due to a Perl dependency, they do not yet work with noux. This script extracts the sampled addresses from a file containing the Genode log output and saves them in the file sampled_addresses.txt. It is not needed when the addresses have already been written into a separate file by the fs_log component. The match string (label) in the script might need to be adapted for the specific scenario. This script extracts the shared library load addresses from a file containing the Genode log output and saves them in the file ldso_addresses.txt. To have these addresses appear in the Genode log output, the sampled component should be configured with the ld_verbose="yes" XML attribute if it uses shared libraries. If multiple components in a scenario are configured with this attribute, the script needs to be adapted to match a specific label. This script generates the files statistics_by_function.txt and statistics_by_address.txt. The first argument is the name of the ELF image of the sampled component. The second argument is the name of a file containing the sampled addresses. The third argument is the name of a file containing the shared library load addresses. It is required only if the sampled component uses shared libraries. The statistics_by_function.txt file lists the names of the sampled functions, sorted by the highest sample count. Each line encompasses all sampled addresses that belong to the particular function. The statistics_by_address.txt file is more detailed than the statistics_by_function.txt file. It lists the sampled addresses, sorted by the highest sample count, together with the name and file location of the function the particular address belongs to. The generate_statistics script uses the backtrace script to determine the function names and file locations. The best location to use the scripts is the build/.../bin directory, where all the shared libraries can be found. Because the file-system server does not find any of the label, label_prefix, or label_suffix attributes, it would conclude that this policy is a default policy, which is certainly against the intention of the policy writer. We now enforce the presence of at least one of those attributes. An all-matching policy can be explicitly expressed by the new <default-policy> node, which is intuitively clearer than an empty <policy> node. When editing a configuration by hand, one would need to take a deliberate effort to specify such a policy. A spelling mistake would not yield an overly permissive policy. With the previous release, we added support for the detection of dynamic ACPI status changes like some Fn * keys, Lid close/open, and battery status information. Unfortunately, not all state changes are reported the same way on different notebooks, e.g., Fn * keys may get reported as ordinary PS/2 input events, or are reported via the embedded controller. Lid close/open changes may be reported by a ACPI Lid event or by the embedded controller. The ACPI event source can be the embedded controller (ec), a fixed ACPI event (fixed), the notebook lid (lid), an ACPI battery (battery), or the ACPI alternating current (ac) status. The value of the event source can be mapped to a Genode input session key as either a single press or release input event or as both. Four new servers were added to the world repository. These so-called "shim servers" do not provide services by themselves but are imposed between clients and true servers to provide some additional feature. The ROM-fallback server was created for scenarios where a system is expected to be populated with new components in a dynamic and intuitive way. ROM requests that arrive at the ROM-fallback server are forwarded through a list of possible routes and the first successfully opened session is returned. An example use would be to fetch objects remotely that are not present initially using a networked ROM server, or in the future to override objects provided by a package manager with local versions. When using the framework as a primary operating system, there is a need to view log information both in real-time and retrospectively without the aid of an external host. The new LOG-tee server can be used to duplicate and reroute log streams at arbitrary points in the component tree. As an example, this allows information to be simultaneously directed on-screen and to local storage. Users occasionally need to remap keys and buttons. While traditional operating systems provide such facilities with very broad granularity, the input-remap server allows arbitrary key-code remapping between any dedicated input server and client. When emulating gaming hardware, there is often a need to resize original display hardware to modern outputs. This is typically implemented in emulation software or at worst the entire native display resolution is downgraded to match an original output. The framebuffer-upscale server performs scaling of small client framebuffers to larger framebuffers servers, isolating this task to a general and reusable component. Thanks to Emery Hemingway for contributing the components described! The current release introduces diffutils and less to the Genode's runtime environment for Unix software (called Noux). Furthermore, the libraries libxml2 and mbed TLS were added to the Genode-world repository. Thanks to Menno Valkema for the initial port of mbed TLS! A native front end to the curl library was crafted, fetchurl. This utility is intended as a source or package management primitive. As a warning, fetchurl sidesteps the verification of transport layer security and is expected to be used where content can be verified out-of-band. This component is a simple front-end to libav. It will play all tracks from a given playlist and can report the currently played track as well as its progress. For more information on how to use and configure the audio player, please have a look at its README file at repos/world/src/app/audio_player/. In version 16.02, Genode gained support for the RISC-V CPU architecture. Genode can be executed on either a simulator or a synthesized FPGA softcore, e.g., on Xilinx Zynq FPGAs. On the latter platform, the RISC-V core is a secondary CPU that accompanies an ARM core built-in in the FPGA. The ARM core usually runs a Linux-based system. The Linux-based system interacts with the RISC-V system via a so-called front-end server, which allows the management of the RISC-V core and the retrieval of log output. Thanks to Menno Valkema of NLCSL for contributing this line of work! Since its inception, Genode provides a uniform component API that abstracts from the underlying kernel. This way, a component developed once for one kernel can be easily re-targeted to other kernels by mere re-compilation. With version 16.08, we go even a step further: Dynamically linked executables and libraries have become kernel-agnostic. A single binary is able to run on various kernels with no recompilation required. The Genode ABI - the binary interface provided by Genode's dynamic linker - had to become void of any kernel specifics. The kernel-specific code is now completely encapsulated within the dynamic linker and Genode's core component. The Genode API - the header files as included by components during their compilation - must not reveal any types or interfaces of a specific kernel. The representation of all Genode types had to be generalized. By default, any peculiarities of the underlying kernel remain invisible to components now. This effort required us to form a holistic view of the kernel interfaces of all 8 kernels supported by Genode, which made the topic very challenging and exciting. The biggest stumbling blocks were the parts of the API that were traditionally mapped directly to kernel-specific data types, in particular the representation of capabilities. The generalized capability type is based on the version originally developed for base-sel4. All traditional L4 kernels and Linux use the same implementation of the capability-lifetime management. On base-hw, NOVA, Fiasco.OC, and seL4, custom implementations (based on their original mechanisms) are used, with the potential to unify them further in the future. At the current stage, all dynamically linked programs (such as any program that uses the C library) are no longer tied to a specific kernel but can be directly executed on any kernel supported by Genode. E.g., a Qt5 application - once built for Genode - can be run directly on Linux and seL4 with no recompilation needed. This paves the ground for the efficient implementation of binary packages in the near future. It is still possible to create kernel-specific components that leverage certain kernel features that are not accessible through Genode's API. For example, our version of VirtualBox facilitates the direct use of the kernel. Or Genode's set of pseudo device drivers for Linux interact directly with the Linux kernel. But those components are rare exceptions. Support for Xilinx Zynq-based hardware has been added to the world repository by the means of additional drivers and spec files. Due to the fact that there is a rather large number of Zynq-based hardware available, adding these as separate build targets to the main repository was not practical. Instead, we went for the approach of adding SPECS for the different boards. Another benefit of this is that these can be specified in a separate repository. Note that changing the SPECS might require a make clean. Furthermore, we added driver components for the SD card, GPIO, I2C and Video DMA to the world repository. Thanks to Timo Wischer, Mark Albers, and Johannes Schlatow! We removed the TAR file-system server because it is superseded by the VFS server with its built-in support for mounting TAR archives.